This is the a major study of the cultural work performed by grammatica, the central discipline concerned with literacy, language, interpretation and literature in medieval society. Grammatica was, with all aspects of Latin literary text, its language, meaning and value. Martin Irvine demonstrates that grammatica, though the first of the liberal arts, was not simply one discipline among many: it had an essentially constitutive function, defining language, meaning and texts for other medieval disciplines. 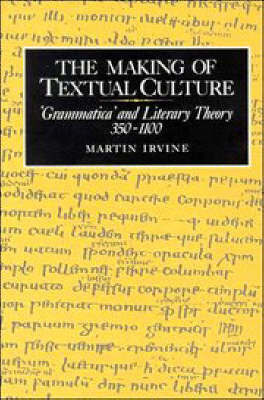 Martin Irvine draws together several aspects of medieval culture - literary theory, the nature of literacy, education, biblical interpretation, the literary canon and linguistic thought - in order to disclose the more far-reaching social effect of grammatica, chief of which was the making of textual culture in the medieval West.